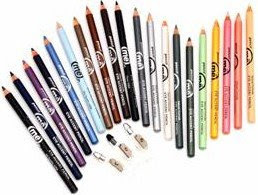 In my never-ending quest to find skincare and beauty products that are safer and healthier, I stumbled across pencil me in cosmetics, a line of eye pencils infused with vitamins and anti-oxidants. The line, developed by Linda Eisner, features 30 different shades. Colors range from soft warm Fall colors of browns/suedes and eye-catching metallic bronzes to smoky misty greys and playful shades of glitters along with cool blues and greens and purples. The colors I checked out were: Pink Lady Sparks, a pale pink with silvery shimmer; Emerald City, a rich forest-green; Amethyst, a jewel-toned purple and Indigo, a muted blue-gray. My favorite, however, was One Cent, a bronze color that made my blue eyes POP! If you're looking to replace your cosmetic products with more natural and healthier alternatives, you might want to add pencil me in to your list. I kinda don't even care how well they work... they're just cute and colorful! I love it. Yeah, cute is a universal panacea, huh?